The Accademia Bridge (Ponte dell'Accademia) crosses the Grand Canal towards its lower, southern end, linking the San Marco district with the Accademia gallery in Dorsoduro. It offers two of the best views in Venice, looking along the Grand Canal in each direction. On one side lies the dome of Santa Maria della Salute, and on the other is the quieter bend which eventually takes the canal towards the Rialto Bridge. In a city of imposing stone architecture it is striking to come across a large, plain wooden bridge (another connects Venice to the residential island of San Pietro in Castello). The simple organic material is an appealing counterpoint to the marble splendours of the Grand Canal. Although there are steady daytime flows of pedestrians, and a few illegal street-salesmen blocking the way with dodgy handbags (don't buy or you're liable to massive fines), this bridge still has much more atmosphere than the other bridges over the Grand Canal, and it is easier to find a peaceful moment here. Apparently Greg Wise proposed to Emma Thompson on the Accademia Bridge: it's a good choice if you can find a quiet time (try late evening). 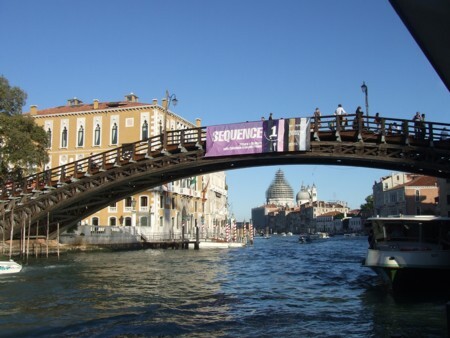 A bridge was first erected on this spot in the nineteenth century, providing a useful lower crossing of the Grand Canal. The 1854 iron bridge (commissioned by the Austrians; designed by an Englishman) was replaced in 1932-33 with this wooden design by Eugenio Miozzi (1889-1979). A competition had been held to select a new design, but none of the entries were sufficiently convincing: Miozzi's bridge was put up as a temporary solution and has become a favourite landmark. The structure was replaced in 1986, but to the same plans. Miozzi, the city's chief engineer, was also the architect of the Ponte degli Scalzi, which, apart from the historic Rialto, was the only other bridge over the Grand Canal until the twenty-first century. He also designed the 1930s car park building at Piazzale Roma, the casino building on the Lido, and the long road bridge, the Ponte della Libertà , which runs alongside the older railway bridge connecting Venice to the mainland. 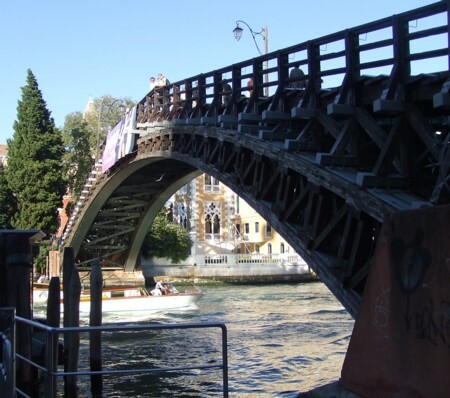 The Accademia Bridge is at one point of the triangle made by the principal routes through the San Marco district, and is around ten minutes' walk from each of the other two 'points'; the Rialto and St. Mark's. Around this area there are street signs to the Accademia which will lead you to the bridge. There is a vaporetto stop right next to the bridge, on the Dorsoduro side. The ferry stop, too, is called 'Accademia'. There is a tourist restaurant with tables right alongside the bridge, and plenty of local cafes and restaurants both on the Dorsoduro side and around Campo San Stefano, a minute away in the San Marco district.